Here is a simple method I created to count all the controls in a C#.NET page recursively. Have a Linksys Router you're trying to get working with WOL? Wake On LAN (Local Area Network, this is your group of computers) is functionality that allows you to turn your computer on by sending a specially built message to it. If you're a computer geek Wake On LAN is functionality supported either by your motherboard or your operating system and your NIC (Network Interface Card - this is what you use for your Internet Connection) that listens for special packets called Magic Packets that it then uses to power on or wake up from a non-interactive state. Wake On LAN can wake up windows from sleep (s3) or hibernate (s4) but you're looking for motherboard support if you want to power on your computer from a shut down state (s5). What are those s numbers? 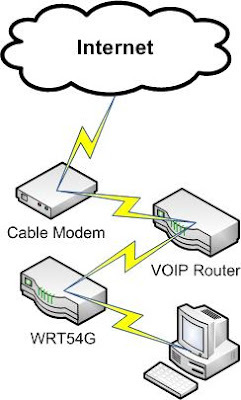 Magic Packets are specially formed UDP packets that signal a specific NIC to send a wake command to the computer. The structure of these packets is a 6 byte header (all ones - so FF FF FF FF FF FF in hex) and the MAC address of the computer to be woken up repeated 16 times for a total of 102 bytes. A MAC address (Media Access Control address) is a special and mostly unique identifier for NIC Cards. Typically it is 6 Bytes long with the first 3 bytes being used to identify the make of the NIC Card and the last 3 bytes being used to identify your specific card. It's important to note that these MAC addresses or Physical addresses are not guaranteed to be unique, or in other words they can be reused. The first thing you want to do if you're interested in WOL (Wake On LAN) is get some information about your computer. You can do this a couple of ways, through a command prompt, or through Windows Network Connections, and you may need help from another computer on the internet for your external IP address. First go to Start>Control Panel>Network Connections. There should be a default one named Local Area Connection. Right-click this icon and choose Status. The choose the Support tab. Then click the Details button. Write down your Physical Address (This is your MAC Address) and Subnet Mask. If you're doing it from a command prompt I'm going to assume you know what one is and how to launch it etc etc. The command you want to type in is ipconfig /all and you will see information about the various NICs installed in your computer. Look for Ethernet adapter Local Area Connection: as this is the default for a windows internet connection and find the Physical Address (something like 00-00-00-00-00-00), and the Subnet Mask (something like 255.255.255.0). The easiest way to do this is to go to http://www.benfinnigan.com/WOL/whatismyip.asp and write down the IP address it returns. There shouldn't be anything else on the page. Want to learn more about WOL before starting? In my particular set up I have a cable modem, piping internet to a VOIP router piping internet to a wireless Linksys WRT54G router piping internet to my machine. Prep the NIC Card: Start>Control Panel>Network Connections>Local Area Connection>Properties>Configure> Then looked around for Wake Up, Wake On LAN, settings under the advanced tab and made sure that everything was enabled for magic packets. Then I went into the power management tab and unchecked the "Allow the computer to turn off this device to save power" checkbox. Prep the Motherboard: While my computer is booting I see the Dell logo and some text about how to get into settings or BIOS (typically F2 or F10 or F something). 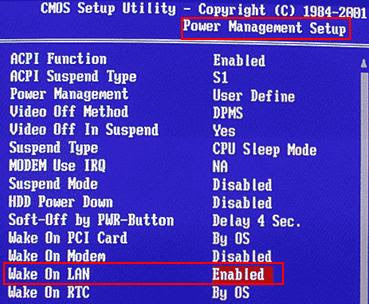 Once I was inside the BIOS I looked around for settings in regard to Wake on LAN sometimes abbreviated WOL. I made sure that WOL was enabled. 1) I used firefox and DOM Inspector to change the value of the IP for port forwarding thereby circumventing the Javasacript validation. You have to have DOMI installed in Firefox, then inspect the page with the port forwarding for applications and gaming, then right-click the value in DOMI, choose edit, and set it to 255. After that is complete just save the settings. On the VOIP router I just forwarded the port I decided to use as the Linksys WRT54G which forwards to the broadcast on my LAN. Wait, what UDP port am I forwarding you ask? It doesn't really matter. Typically WOL is on 7 or 9 but as long as you pick a port that isn't being used by another application (in other words pick something really high) then you're probably just fine. I also added functionality to send the packet every few seconds so that I could power down my machine while I had a remote machine sending packets to me every 60 seconds and see if my machine turned back on. If you don't want the click once installer you can download it from http://www.benfinnigan.com/WOL/WOL.zip Like usual, if you find the app useful, please drop me a line. If you're having a hard time getting WOL to work for you, then try this forum to get your particular issue sorted out. Disclaimer: The views expressed in this blog entry are provided "as-is" with no guarantee expressed or implied. If tweaking this stuff bricks your box or your router I'm not responsible. Any sites I've linked to are not to be construed as an endorsement and I cannot be held responsible for anything that goes on within other internet sites and their products or forums. I’ve thought about this kind of device on more than one occasion, but it seems like it would raise privacy concerns. The device hooks into your OBD2 and transmits data to Progressive about how much you drive, how fast you turn, start, or stop, and what time of day you are driving. They assure the consumer that unless legally obligated they will keep the information about your driving style to themselves, but I'm guessing it won't be long before the culpable driver in accidents will be determined with a device such as these. Beware consumer - Big Progressive is watching! Male Chauvinist Pigs Make More Money? Isn't that interesting? The comments at the bottom gave some interesting ideas as to why there may be a correlation. I would question whether it's just a simple issue of age of theology, because older individuals tend to have more traditional beliefs and they tend to be further along in their career hence making more money. I wonder what the trend will look like in about 50-60 years. First let me say, I like to play Force Unleashed on the Wii. I think that despite it's shortcomings as a game the story is entertaining and I like the force powers enough to enjoy it and recommend it. One thing that is driving me absolutely crazy is the lousy printing job done on the manual. I'll scan some pages in and add them to this post later. Honestly though, it's all black and white. I can't see half the pictures as anything besides black squares and the descriptions on how to work things is so limited it's a real let down. I guess all the time they should have been pouring into the manual ended up as the tutorial section of the game and all the helpful tips. Please next time let's use the color printer - Lucas Arts are you listening? Well, my sister has found a product that both her and her baby enjoy called a mini monkey that she now imports and makes available at www.gosette.com. Anyway, I thought I would put up some pictures with a link to pictures from her album of minimonkey travels. Livecycle ES - ALC-DSC-110-000: com.adobe.idp.dsc.registry.endpoint.EndpointStoreException: endpoint registry failure. Well, this error was the bane of my existence this evening. Anyway, when you get this error you'll find that workbench will not allow you to delete or remove the endpoints or category associated with the processes you were trying to remove. To clean out the rest of the data, you have to turn to the database and write some custom SQL to get the orphaned records out of tb_sc_endpoint where the name is the one you're trying to get rid of manually and tb_sc_service where id is the name of the one you're trying to delete. To recap, if you get the ALC-DSC-110-000 error when trying to remove a process / orchestration and need to manually remove the remaining records delete from the tb_sc_endpoint and tb_sc_service tables where name or id is the process you were trying to delete when you got the error. I hope that makes sense, feel free to post any questions you may have as comments. VW 1-liter Car - It's Coming by 2010! The 1-liter car from VW is so named because it takes a mere .99 liters to propel the vehicle 100 km. That translates to about 235 MPG! Hypermilers move over, hybrids and fuel cells hide in shame, this car was originally prototyped in 2002! Now the car will be produced in small quantities by 2010, I've not found anything that says if it will be sold in the US, but if it is I'm getting one! Back in 2002 I emailed Volkswagen and offered to drive a slightly-modified version coast to coast in the United States on a single tank of gas. It would only need 12 gallons of gas to get from New York City to Los Angeles! If I could get my hands on one I'd drive it with one of those mini-laptops and a pcmcia card for broadband access and set up a digital camera on the dash so that the world could see the entire drive from coast to coast (accellerated of course). I'd have to make sure that the camera also showed the fuel gauge and the odometer. I'd blog about the trip and post the videos. Long story short, they wrote me back and told me that they appreciated my interest in the car. Now, the big news is the car is greenlit for production at the automaker's prototype shop, which can only produce 1,000 cars per year max. They're aiming for pricing 20,000 and 30,000 Euro ($41,200 to $61,800). They've made a few changes from the prototype; however, the stunning mileage numbers are not expected to change hugely. Well if anyone from Volkswagen is reading this post, the offer still stands. Let me show that car off from New York City to Los Angeles! Basically, this happy looking guy takes everything under the sun and blends it with a blender. It's kind of like watching a trade show demonstration. OK, so, I just realized it's entirely possible some people have absolutely no idea why I went to the effort of making the posts script and the sidebar widget. It's simple really, when I read other peoples' blogs I find myself scrolling around like crazy. I hate scrolling, so I decided to come up with a solution to the problem rather than just complain about it. Now, on this blog, you'll likely still do some scrolling (especially on long posts); however, you won't do as much with the navigation scripts place. It's kind of like tab-navigation for your blog. I went ahead and tweaked out my sidebar navigation code to provide similar functionality for blog posts. 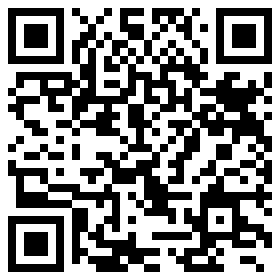 Please give me a link back if you swipe the code and please let me know if you find errors. So, I just finished up a little sidebar navigation widget that helps de-clutter the ole blog. If you play with it, please give me a link on your blog somewhere. If you find errors, please feel free to post a comment.
' The function SecureHash generates a 160-bit (20-hex-digit) message digest for a given message (String).
' It is computationally infeasable to recover the message from the digest.
' The digest is unique to the message within the realms of practical probability.
' The only way to find the source message for a digest is by hashing all possible messages and comparison of their digests. If you find it useful, please post a comment letting me know. Firefox 3.0 DOMI (Dom Inspector) is missing! The weird thing is that if you don't click the add to firefox button directly from that page you actually get an Add-On not found page that forwards you back to the search page... LAME. Anyway, the one by Shawn Wilsher (sdwilsh) is the right one, Enjoy! OK, so I went to the store to buy a light for a fan I have up in my house and lo and behold I'll be darned if Home Depot or Lowes has a light with medium (non-candelabra) bases. I have no idea why these are moving in that direction as I would think a single standard base would be more desirable. Who knows, maybe knuckleheads are burning down their homes putting bulbs in that are over the 60W limit. Today Tuesday 6/17/2008 at 1PM EST Download Day for Mozilla Firefox 3.0 officially started. Since then the spreadfirefox.com site ( http://www.spreadfirefox.com/worldrecord/ ) has been experiencing many of the symptoms of a DDOS (Distributed Denial of Service). What I'm seeing in Firefox 2.0 is "The server at www.spreadfirefox.com is taking too long to respond." So, we bought a Wii with our stimulus package and I love it! I got out of console gaming because there were getting to be too many buttons on the controllers and I couldn't just sit and play a game. Now, with the Wii I find games intuitive and easy to play again. Mario Kart is an excellent example of intuitive gameplay... You have a wheel, use it to steer. I've had benfinnigan.com for a while now and it's been useful a couple of times, but now it's time to hand over the maintenance to blogger/blogspot. I found I mostly just wanted a blog anyway and kept the web space around for tinkering- I guess now I'll have to tinker on my localhost.